30 (33, 37, 40, 43, 47, 51). 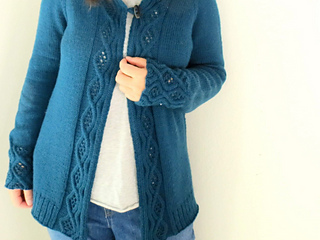 Sizes based on chest measurements of finished sweater. 1 to 4 inches / 2.5 to 10 cm positive ease recommended. Sample shown in size 40 with 2”/ 5 cm positive ease. 20 sts x 26 rows = 4” x 4” / 10 cm x 10 cm in stockinette stitch after blocking. 24 sts x 30 rows = 4” x 4” / 10 cm x 10 cm in cable stitch (Chart A) after blocking. Cable stitch gauge affects hood and cuffs only, and can be modified for length easily in those areas. If both gauges cannot be achieved, it is more important to get accurate stockinette stitch gauge for fit. 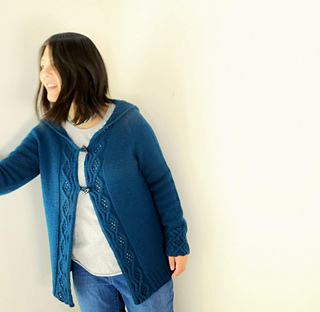 Hooded cardigan with cables and eyelets stitches on hood, front edgings, and cuffs. Sweater is worked flat from top down with minimum seaming. CO for hood, and work in chart until base of neck. Work Raglan increases for sleeve and body. Join front and back at underarm. Work sleeves in the round. Seam the CO edge of hood together. Written instruction for each chart is included. pattern is tech edited by Sue Hislop.